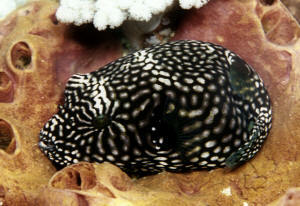 Arothron mappa (Lesson 1831), the Map Puffer. Indo-Pacific. To twenty-seven inches. Needs a system of hundreds of gallons. Will be the only fish. My question is... I can Not figure out the best way to puffer proof the power heads. Omg! Too many horror stories about that! Some suggestions are sponges, but with their curious nature that sounds like an accident waiting to happen. I thought about lighting grate. I think people call it egg crate? I could build a little cage around my power heads? The squares look awful big. I dontbknowcwhat size the fish will be when I finally purchase it. I did find a product for crafts called Darice 7 plastic mesh. It is 7 squares per inch. I am waiting for an email back and hoping they will tell me what it is made of. I know what it do with the cords. But can't figure out the safest for my power heads. Hee hee I had ordered some Hydor 3250 gph but whoa! What a sand storm, lol I tried some 1950 but not enough flow. the little fellow could escape if needed. Maybe that should be 30 seconds? I am setting up a 40g qt. I bought a large sponge filter which is seeding in the sump. I bought a bio wheel 350 but have no place to put it on the 150 to seed. Can I cut some aquarium foam and put in the sump. Sorry for the long post. I just thought you might be missing me..lmao! !HaVe A hApPy DaY :)Stace. 1.010 sg, crushed coral, rocks and boxwood, stocked with Sailfin mollies, Orange Chromides, and a small Dogface puffer. The tank has a few mollies in it now for the conversion. Now my questions are; 1) I have read the Orange Chromides can have a sg of up to 1.012. Can I keep the puffer and Chromides happy at 1.010? I know any fish could be at risk with the puffer especially the mollies but that aside, is it possible? 2) I also read to raise the salinity at a rate of .002 sg per week until I hit the desired amount. Do you agree? 3) is crushed coral okay to use as a substrate? I have read as much of your work as I could find on the web but I guess I want some confirmation on my plan and if it is okay. I really want to keep the Orange Chromides and DF puffer together if possible. Thank you for your response! Just for clarification, can the dogface puffer live in these conditions for life? If not, then What is the lowest salinity for life that the puffer could thrive in if not full marine? I also have read the Volitans Lionfish can tolerate low salinity but I can't find any info as to how whether or not they can thrive in low salinity. What is your feeling on this fish as it pertains to living in perminate lower salinities and how low that salinity might be? Thanks again. <When I bought my juvenile specimens back in 1990 they were being sold as freshwater fish, and I've no doubt at all these fish are incredibly tough. Well yes, Bob, agreed; but what would be “too dilute” in this instance, for a demonstrably euryhaline, lagoon and estuary dwelling coastal marine species??? Yet how to explain the “standard operating procedure” of yesteryear when species such as this were kept at SG 1.018? Was often stated to be less stressful, kidneys having to work less hard… that sort of thing. So far as reading goes: do review Klaus Ebert, Aqualog pufferfish book… Arothron hispidus said to be healthy “a long time” in brackish (by which the author seems to mean half-strength seawater) though not permanently. As stated in previous comments: I would not have a problem keeping a youngster thusly (quite possibly more natural than fully marine conditions for such) but once half-grown, say, would acclimate to near-marine… SG 1.015 upwards… and be prepared to either trade in (for another youngster) or move to fully marine. Thank you both for your insight. I agree that it is more natural to migrate this puffer to full salt over time, but also believe that there is nothing natural about keeping fish in a small glass box. That said, I do try my best to ensure the fish I keep are healthy and hopefully happy. If I am understanding you correctly, the safe answer to my question about keeping a dogface puffer healthy in 1.010 SG for long term or maybe for life is that it should gradually be migrated to marine over time. However, I guess the real answer is, who knows since no research has been done. I will take your advice Neale and start a youngster in 1.010 and keep a lookout for stress and he grows. Worse case for me is I get another saltier tank for him. What a great excuse for a new aquarium! I think this will be a unique and fun setup (for a while at least). Thank you again for the help and I sincerely appreciate the dialog. <Most welcome. Good luck with your project; maybe let us know how things turnout a year or two from now? I'm planning on upgrading my tank hopefully by the end of the year to a 96"x26"x24" or 96"x30"x24" and was wondering would this size of tank be suitable for both these fish when they reach adult size? I was also looking to add some other bigger fish like the sailfin tang and maybe 1 other large angel but if that's not possible then no worries my main concern is that the tank I'm upgrading to would be able to house my two current fish for their entire life, I would greatly appreciate your expert advice on this. My Arothron hispidus is eating the fake corals. would do the same and who eventually died of impaction. I greatly appreciate any suggestions! and are no longer present. Today in my LFS I saw a pair of Henis that I would like to add. I've read that they are timid and my puffer can be territorial, but is there a chance of this working if I do things slowly? Thanks P.S. They're the acuminatus variety. I was following a conversation on one of the fish forums about the different Puffers and the space needed for them. Everyone had a thought and a few of them were even convincing but I'm not sure that they are true or right. Why does a Arothron stellatus (Starry Puffer) require so much more tank space than the Arothron mappa (Scribbled Puffer) when they get to be about the same size in an aquarium? Sorry, I believe I was unclear in my previous email. I know that in nature Starry Puffers get to be around 4 feet long. However from the little information I have found states that in captivity they only grow to be about 2'6", and I was wondering why they need so much more tank space than the Mappa Puffer who gets to be about 2'2". Is it the stunting that can happen? Is it to allow for the possibility of 4 feet though it is unlikely? Or is the information I read here http://www.liveaquaria.com/product/prod_display.cfm?c=15+39+263&pcatid=263 incorrect? Sorry, I believe I was unclear in my previous email. I know that in nature Starry Puffers get to be around 4 feet long. <Still hardly a small fish! We're talking tanks measured in gallons by four figures rather than three. Tetraodon mbu is a freshwater species of comparable size, and it needs something like 1000 gallons. 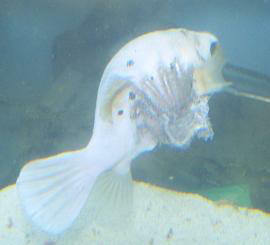 and I was wondering why they need so much more tank space than the Mappa Puffer who gets to be about 2'2". Is it the stunting that can happen? Is it to allow for the possibility of 4 feet though it is unlikely? Or is the information I read here incorrect?